Cheap Mama Chick: Check out Kindle FreeTime for Kids! Kindle FreeTime is a cool new service from Amazon to help give parents piece of mind when it comes to tablet use. Create a profile for each of your children and you choose what books, apps and videos you want to give your kiddos access to. Kindle FreeTime is free on the NEW Kindle Fire (which currently is just $159 shipped from Amazon here! Set Screen Limits- With Kindle Fire FreeTime, you can set daily limits for Kindle Fire use, or restrict certain categories - like games, apps and video - while leaving unlimited time for reading and learning! When kids use Kindle FreeTime, kid's have their very own, personalized tablet. The background color and fonts will change to a kid-friendly design. They will only see the titles that you give them access to. The screen carousel will show only their recently viewed titles. 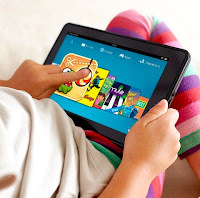 Kids can navigate visually to content based on characters or topics - for example "Cars", "Math" or "Kittens"
Built ToughKindle Fire is designed to stand up to accidental bumps and scrapes. The state-of-the art display is 20 times stiffer and 30 times harder than plastic, so you can let your child play, without worry! Check out the Kindle Fire (which currently is just $159 shipped from Amazon here!